Education and outreach is a major component of the ACA's organizational philosophy. The ACA is committed to supporting educational and research experiences for everyone. 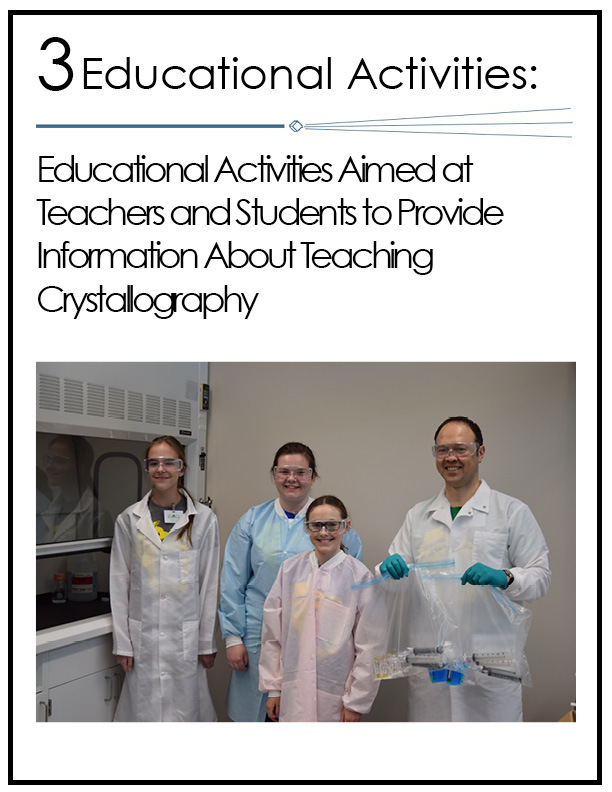 It is through education and outreach activities that we will inspire the next generation of scientists and crystallographers. The ACA supports outreach and education in science, including activities such as crystal growing competitions, educational videos, and events for the public. The ACA has been honored to support a number of different endeavors, all over the United States and for all different ages and educational levels. The primary mission of the ACA is to promote the study of the structure of matter, and to advance the tools and methods used in such studies. The specific initiatives through which the ACA pursues this mission are articulated and driven by its members. As a matter of policy, the ACA does not provide financial support to initiatives originating outside of its membership (e.g., initiatives proposed by outside organizations). The ACA's goal is to promote the study of the structure of matter and feels that inspiring a new generation, assisting current students and offering continuing education for established scientists is incredibly important. If there is an initiative that falls within the parameters of the ACA's sponsorship policy, while we do not guarantee sponsorship, we encourage the submission of a sponsorship request. The deadlines to submit requests are April 1st, June 1st and October 1st each year. If granted the ACA may request the inclusion of the ACA logo at the proposed event. At the conclusion of the event or sponsorship the ACA should be provided with testimonials and/or photos of the event for promotional purposes online or in any of the ACA print publications. ACA Workshops are organized every year in conjunction with the annual ACA Meeting and are generally held on the prior to the commencement of the ACA Meeting sessions. For an applicant to organize/host such a workshop certain requirements must be met. Applicants are encouraged to also check the ACA homepage for any changes or additional requirements prior to proposal submission. Applications should clearly indicate how each of the requirements below is to be addressed. Workshop proposals need to be submitted to ACA Headquarters by September 1st of each year. Once collected they are evaluated by the Education Committee and the ACA Council. Council will then advise the organizers of the acceptability of the proposal and, if approved, forward any budget recommendations/requirements from the Treasurer. The ACA was excited to offer one year of free membership to students who completed the 5th NYU X-Ray Workshop (June 26-28, 2018). 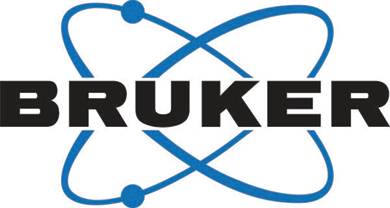 The ACA was excited to offer one year of free membership to students who completed the fourth “Modern Methods in Rietveld Refinement for Structural Analysis” (June 17-22, 2018). 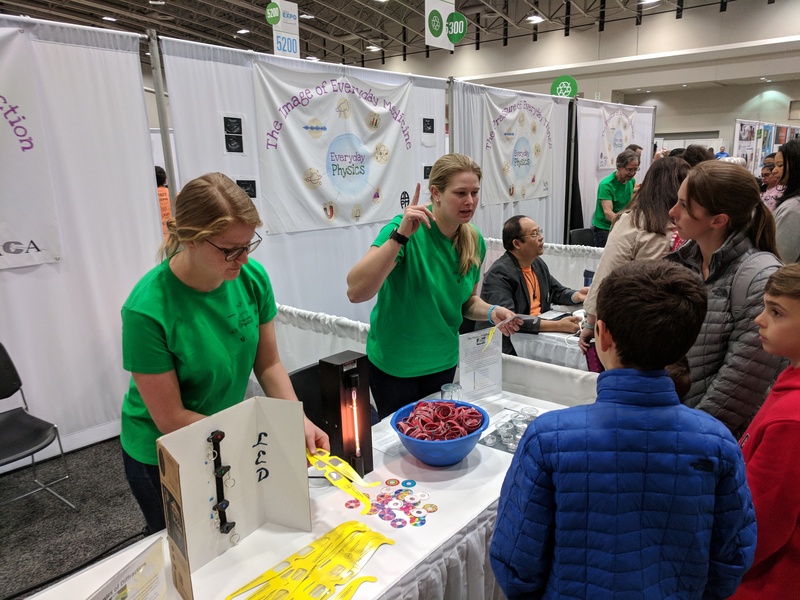 The ACA participated by hosting a booth and demonstration at the USA Science & Engineering Festival in Washington, DC (April 6-8, 2018). The ACA has been a proud continuing sponsor of the United States Crystal Growing Competition. 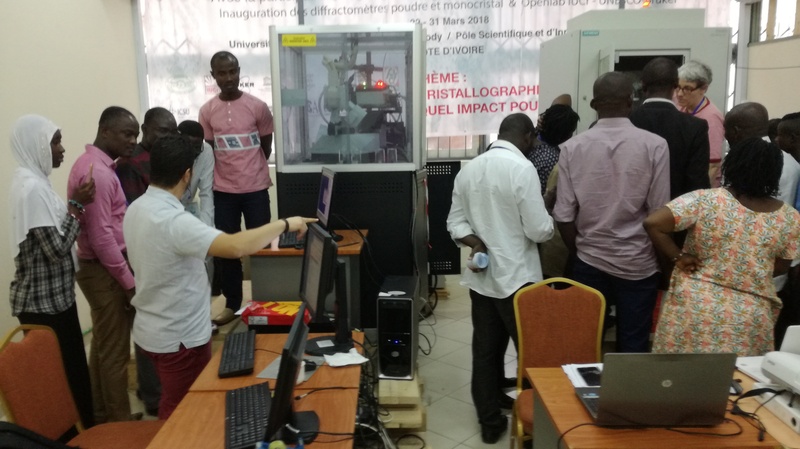 The IUCr, along with ICSU, UNESCO and other agencies, have identified Africa as an area in need of development and support for burgeoning crystallography research. The ACA has started a fund to support students from developing African countries in attending annual ACA meetings, as well as various ACA schools and workshops. Funds will also go to awards for outstanding presentations by African students at conferences within Africa, and will be used to support outreach efforts in developing African countries and in bringing African visiting scientists to North America. 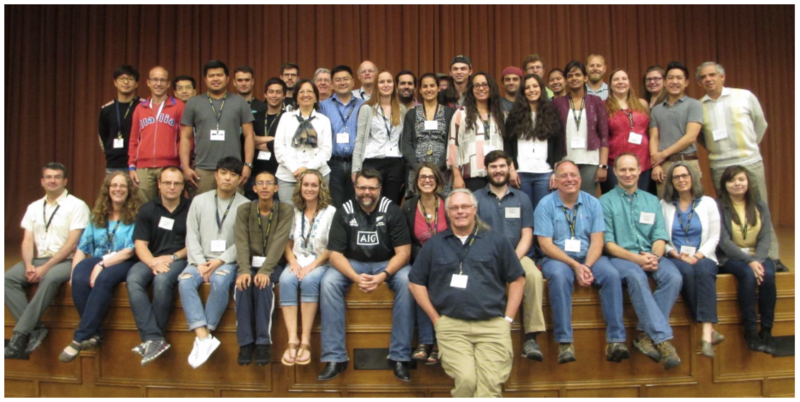 The ACA Summer Course in Chemical Crystallography is a program that is now into its third decade of instruction here in the United States. Applications are accepted starting on January 1st. The objective of the ACA summer courses is to provide training both in theoretical and practical aspects of crystallography, primarily to graduate and postdoctoral students. While crystallography continues to play an increasing role in the physical and biomedical sciences, the simple use of highly automated procedures and techniques can lead to gaps in fundamental knowledge of the subject, and hinder it's successful application to unusual or difficult research problems as well as proper interpretation of results. 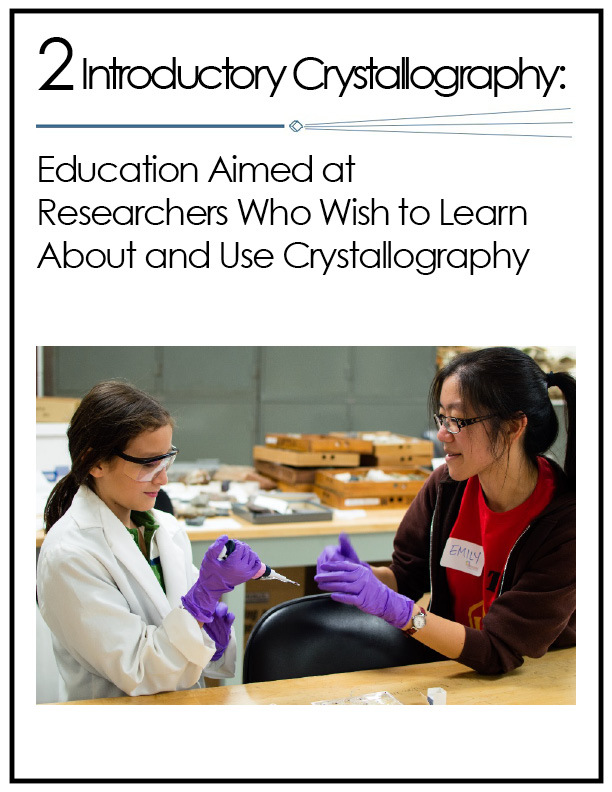 Many institutions do not offer much, or in some cases, any, formal training in crystallography, yet this knowledge can be crucial for the next generation of scientist's research efforts. 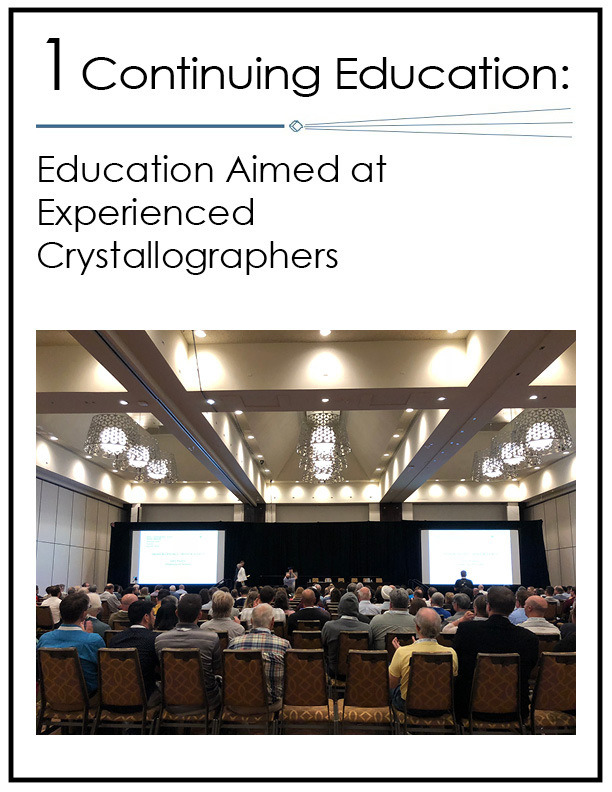 The ACA summer courses are intended to fill this knowledge gap by providing thorough training in crystallography, either by supplementing training from the home institution, or by providing an initial background in proper practices for new labs. The courses are taught by recognized leaders in the field, have an extensive hands-on component while also covering theoretical foundations, and serve as a knowledge base in that valuable contacts made with instructors and fellow students often are maintained by the participants for years.